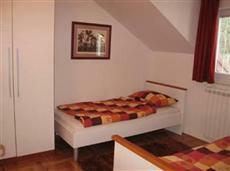 The Jelenovac Apartments Zagreb offers Zagreb accommodation in an out-of-the-way city location. The hotel is surrounded by its own small garden, and it is within easy walking distance of many of Zagreb's attractions, restaurants, entertainment venues, and businesses. The Jelenovac Apartments Zagreb is right off Zagreb Ilica, the city's main road, but it is far enough out of the way that the hotel recommends its guests have their own form of transportation, as the public transportation stops are quite a ways away. Guests who drive to the hotel can park there for free. The apartments of the Jelenovac Apartments Zagreb come with kitchenettes with espresso machines, microwaves, toasters, and fridges, which are already stocked with drinks and food. The rooms also include washing machines so that guests can do their own laundry. Guests of the Jelenovac Apartments Zagreb can expect to take advantage of many amenities, such as air conditioned public areas, a business center with a computer and a printer, and a security safe. The apartments are regularly serviced, but guests can request extra cleanings if they wish.